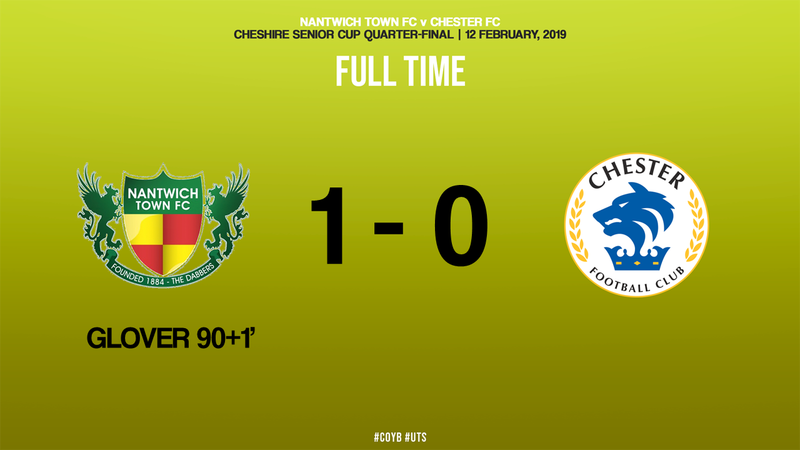 The Blues exited the Cheshire Senior Cup at the Quarter Final stage this evening, after an injury time goal denied a Chester side who battled well after playing an hour with ten men. George Green was sent off on 42 minutes for a lunge in the middle of the park, and Danny Glover converted late for the defending champions. Anthony Johnson and Bernard Morley made four changes to the side that lost at Kidderminster, including a change of keeper. Connor King wasn’t in the thick of the action in the early stages though, as Sean Cooke blazed two efforts over the crossbar. A quiet half was brought to life by some big decisions by the referee. Cynical fouls by James Lawrie and Scott Burton were deemed yellow cards by Mr Sam Mulhall, but then George Green was shown a straight red card for a late tackle in the middle of the park. The only big chance of the 45 went to the hosts. A corner from Lawrie found the head of Toby Mullarkey, but he could only rattle the crossbar. Despite the man disadvantage in the second half, the Blues played with positivity at the start of the half. A good move involving Brad Jackson and Burton ended with Dan Mooney’s side footed effort being parried away by Will Jaaskelainen. From the resulting corner, Gary Roberts was also denied by the keeper. Connor King had a big save to make before the hour mark, a fantastic save with his left foot to deny 39-year-old Ricardo Fuller from close range. The Blues then hit the woodwork with ten minutes to play. A superb turn of pace by Akwasi Asante allowed him to shoot, but he lashed his effort against the outside of the post. A superb solo run by teenager Lloyd Marsh-Hughes was then excellently stopped by Jaaskelainen – and then came the big blow in added time. Luke Walsh put in the dangerous cross from the left, it bounced around, and then Danny Glover off the bench was in the right place at the right time to convert. NANTWICH: Jaaskelainen, Morgan, Cotterell (Walsh 77), Stair, Mullarkey, Bourne, Lawrie, Hughes, Fuller (Glover 61), Cooke, Saunders (Jones 82). SUBS NOT USED: Bell, Malkin. CHESTER: King, Jackson (Marsh-Hughes 77), Howson, Livesey, Waters, Mooney (Thomson 65), Roberts, Burton, Mahon (Asante 65), Green, Dudley. SUBS NOT USED: Shenton, Murray.